Sutton’s Index of Deaths provides additional information related to the motivation for particular killings. Extracting this information from the description field it was then possible to map those people who were killed by Republican and Loyalist paramilitaries because they were alleged to have been informers. Data is mapped at electoral ward level and is based on the 2001 Northern Ireland Census survey results. There are 582 electoral wards in Northern Ireland as defined by the Boundary Commission for Northern Ireland in 1995. The electoral ward shapefile was downloaded from EDINA borders website. 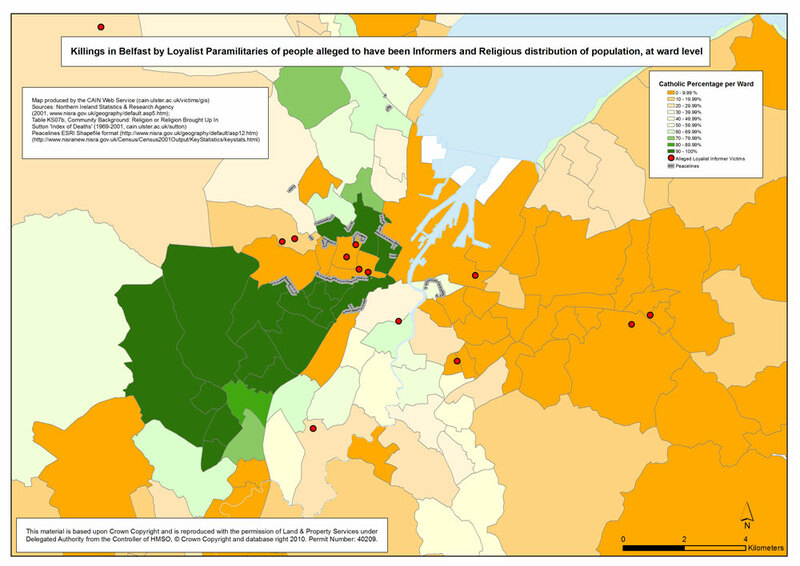 The religious background data was downloaded from the Northern Ireland Statistics and Research Agency. The Irish Republican Army (IRA) had a long-standing policy, one which pre-dated the 'current' conflict, of considering a penalty of death for any member of its organisation whom it regarded as being an informer. This policy was first set out in 'General Oders No.17', 2nd April 1921 (see: Hanley, 2010, p.17). The killing of its own members, or ex-members, who were alleged to have been informers, or destroyed arms, or who failed to carry out orders while on active service, was a recurring theme of the history of the IRA. However, during the conflict in Northern Ireland from 1969, the label of 'informer' could also be attached to civilians who would subsequently be killed. The families of those killed, both memers and non-members, often denied the allegation made by the IRA. Following their formation, Loyalist paramilitary groups appeared to adopt the same IRA policy and they killed a number of people they alleged were informers. The first map above is one which shows the killings of alleged informers carried out by Loyalist paramilitaries. The map is for Belfast where most of such killings occurred. The second map shows the distribution of killings of alleged informers by Republican paramilitaries in Belfast. These deaths occurred almost exclusively in 'Republican areas'. 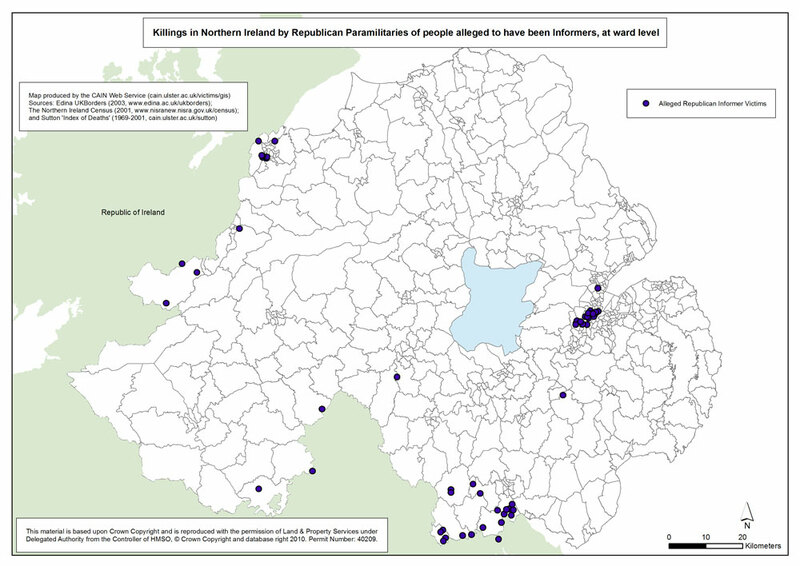 The third map shows the distribution for Republican killings around Northern Ireland. This map highlights the number of killings that were recorded close to, or on, the border with the Republic of Ireland. The table used was Table 7S07b Community Background: Religion or Religion Brought Up In. The GIS maps listed above have been produced as part of the AHRC 'Visualising the Conflict' Project. The maps have been reproduced and made available with the permission of Land & Property Services under Delegated Authority from the Controller of HMSO, © Crown Copyright and database right 2010; Permit Number: 40209. PDF versions (A4 approx; 300dpi) are based on original TIFF files. L-JPG versions (1000px700p approx; 72dpi) are low resolution JPEG images. H-JPG versions (A4 approx; 300dpi) are high resolution JPEG images.